A two-level 1958 Goodman home is for sale in Alexandria’s Hollin Hills, Charles Goodman’s first and largest neighborhood of modern homes in the Washington, D.C. area. The five-bedroom house, which sits on .64 acres, is listed at $750,000. 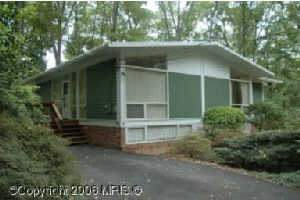 The homes in Hollin Hills were designed by Charles Goodman and developed by Bob Davenport beginning in the late 1940s. The last home in the 458-home community was finished in 1971. Here are directions to get to Hollin Hills.